Being a researcher and living in Washington, DC has its advantages, with the National Archives’ depositories of documents accessible to the public. With so much available online, it is easy to forget the feeling of holding a century-old document in one’s hand. The paper might be yellow, brittle or creased, but in addition to the information it possesses, that piece of paper is a connection to the past. An ancestor’s hand passed across that same piece of paper. A recent project had me accessing several record sets at the National Archives. 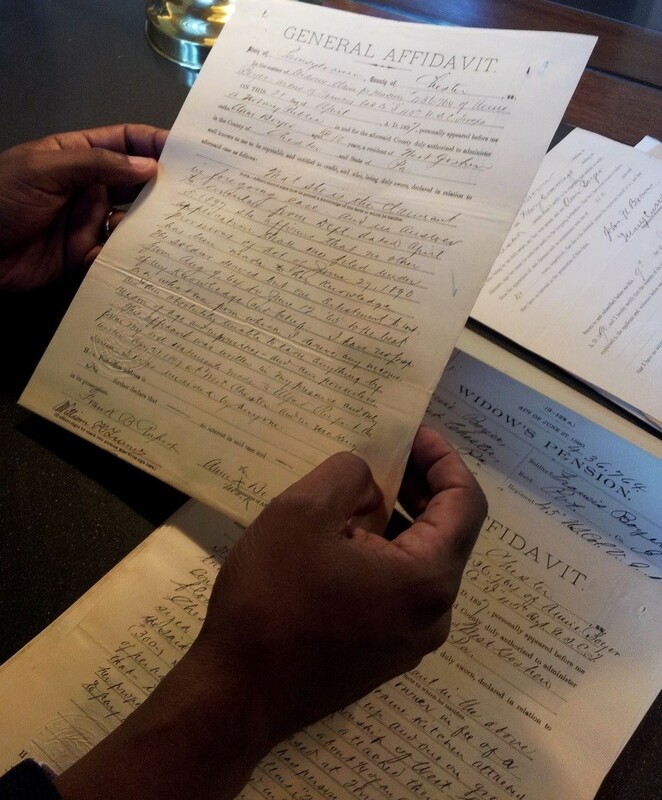 Since my client also lives in DC, I brought him with me to the research room to view his third great-grandmother’s application for a Widow’s Pension after the death of her husband, a member of the U.S. Colored Infantry during the Civil War. The Widow’s Pension files can be a genealogical treasure trove, but in this case, they were more: connecting the Civil War to the present day.